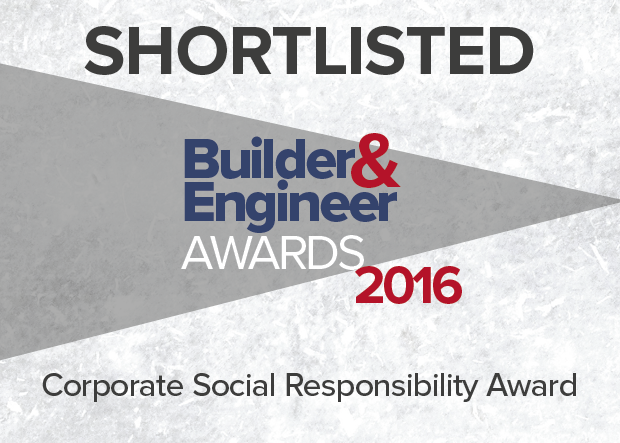 IKO Polymeric has been shortlisted as a finalist in the ‘Corporate Social Responsibility’ category of the Builder and Engineer Awards 2016. As market leader in the single ply roofing sector, IKO Polymeric is committed to minimising its environmental impact. Energy efficiency, waste management and supporting local people are all important considerations for the organisation. This is evident through IKO Polymeric’s heavy investment in Clay Cross, the site of a disused colliery in Chesterfield. An area hard-hit by industrial recession, the company has contributed to the local economy with much-needed employment including an apprentice programme for young people. IKO Polymeric’s involvement in the local community is important. It recently volunteered to refurbish the roof of Boythorpe Community Centre which was about to close due to insufficient maintenance funds. IKO Polymeric offered to install a single ply roof and undertake the interior decorations free of charge. The company is also a member of the ‘Kidsafe Supporters Club’ run by Derbyshire County Council and IKO Polymeric has funded road safety packs for 7 – 11 year olds. Celebrating its 13th anniversary, The Builder & Engineer Awards is one of the largest and most established awards programmes in the sector – providing the ideal platform to recognise the best products, projects, companies and individuals. The winners will be announced on 30th November 2016 at a black-tie ceremony for 500 guests at the newly redeveloped Main Stand, Anfield – home to Liverpool Football Club. Hosted by Liverpool-born actor, comedian and writer, Neil Fitzmaurice, this year’s guest speaker is former England international footballer, Sir Geoff Hurst MBE.